Welcome to the Aladdin’s Loot Slots Review. Aladdin’s Loot is five reels, twenty-five pay line high-definition (HD) online slot machine for real money. Saucify Casino Gaming software powers this video slot game about the Motion Picture Aladdin. Saucify slots gaming software is the new BetOnSoft / Saucify gaming software. The people that live in the United States of America, Canada or anywhere around the world can play Aladdin’s Loot online and mobile slots for real money at our recommended Saucify casinos listed on the bottom right-hand side of this review page. When you begin to spin the reels and play “Aladdin’s Loot” online slots for real money at one of the best USA online casinos for slots you will select the amount of money you want to wager per spin. The lowest amount of money that you can play Aladdin’s Loot with is one penny per spin, and the largest coin denomination is ten cents. This betting range means that when you bet the maximum with all twenty-five pay lines the most you can bet is two dollars and fifty cents. This game may not be the best for high limit online slots players as it has low betting limits and is a low variance game. Now that you have select the amount of money you want to play with you can click the “Spin” button and start to see the story of Aladdin and the Genie of the lamp unwind before your eyes. There isn’t anything outstanding about this game when it comes to gamble features, expanding wild symbols and other exciting things that make real money USA slots game appealing. Many people like to play this online slot machine for real money on the go with their mobile Smartphone’s and tablets because they like the story and gamblers love the graphics. There is thirty-eight possible real money winning combination in Aladdin’s Loot. When you are playing this video slot machine powered by Saucify Casino gaming software you will see flying carpet icons, Aladdin, Princess Jasmine, Abu and other traditional playing card symbols. The wild symbol in this game is the Aladdin image, and when you get an Aladdin wild icon, it will substitute for all of the other icons to help you form a winning combination except the scatter image. Play Aladdin’s Loot online slots for real money at one of our recommended Saucify / BetOnSoft casinos and start your winning streak now. Aladdin’s Loot is not the only game based on Disney’s story of Aladdin. No land or online casino software developer has a license with Disney to develop their movies and shows into slot machines. However, there are many games like this one, that is loosely based on the Disney movie. 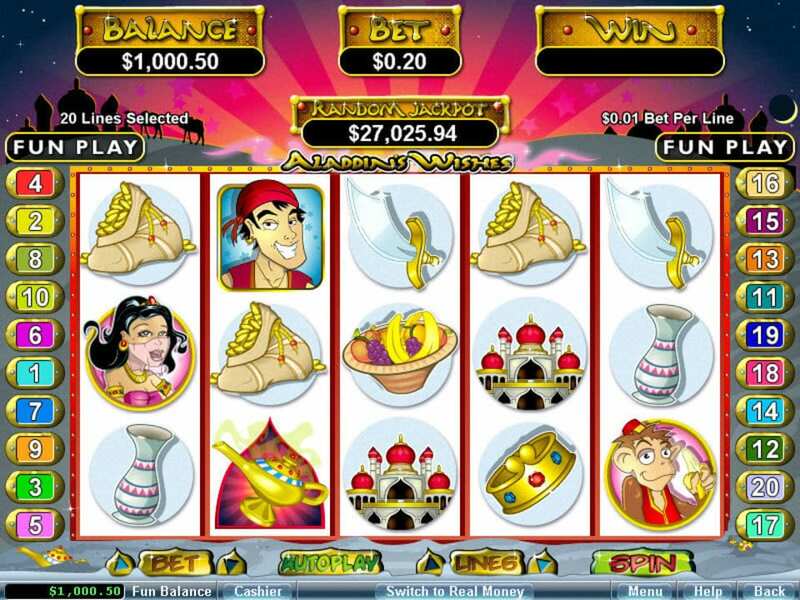 PlaySlots4RealMoney.com likes Aladdin’s loot but is not very fond of the Saucify casino games. They have a few titles that we like, such as Aladdin’s Loot, but we don’t care for most of them. When you start to play this game, you will hear an Arabian soundtrack, which is nice and fitting for this game. Saucify did a decent job with their animations but there is a sound that the slot machine makes whenever you can an animated win. Honestly, we don’t like that particular sound. However, a win is a win, right? It is pretty easy to score free spins and the good news is that you can double your winnings when you hit free spins. However, there is no fixed-coin or progressive jackpot. Last Updated December 3, 2018, By Jack Gold Of PlaySlots4RealMoney.com.